Spending precious time maintaining and overhauling stuff that already exists and can be replaced with something new and shiny is considered a waste of time in current U.S. culture. Why not just buy whatever you want on Amazon and be done with it? Then, your free time can be spent on other time-wasting activities that do not involve brain power, pride of workmanship, and plain old satisfaction in a job well done. Instead, no analysis is given to the environmental cost of throw away technology, not to mention the cost to your creativity and skill set. Even if you are not a Buddhist, you may be able to appreciate the joy one can derive from honoring the work of one’s elders. 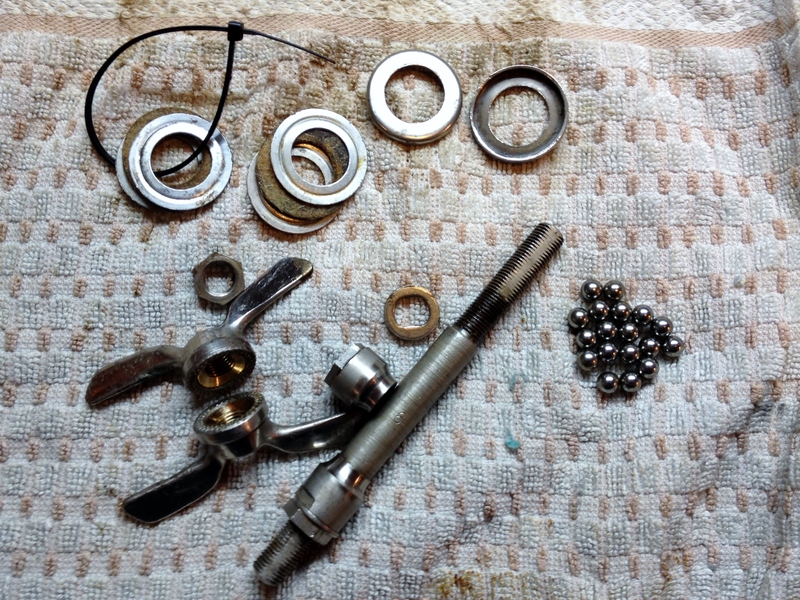 Every time I overhaul a vintage bicycle I am overwhelmed with enthusiasm and respect for the work of those innovators who came before me. 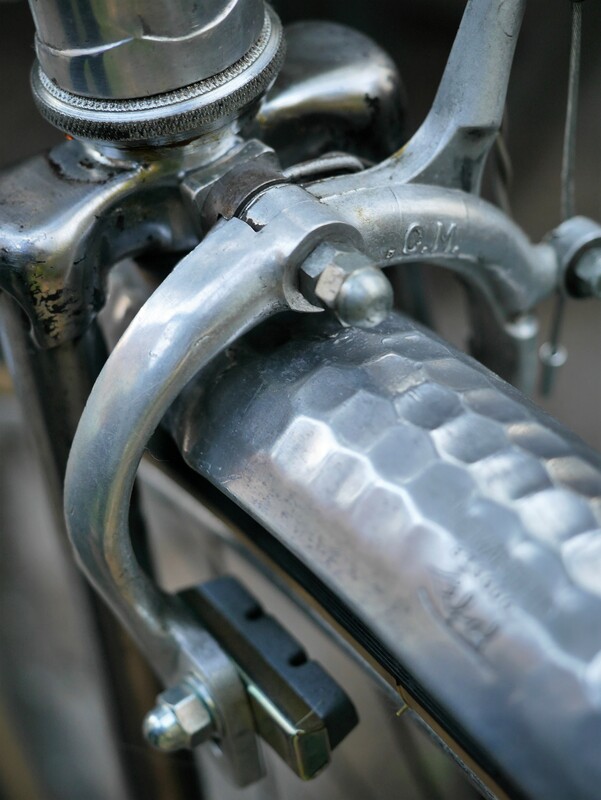 Bicycle lore, including engineering concepts and technological breakthroughs, was well established by the early 20th century, a fact which will shock many cyclists today. 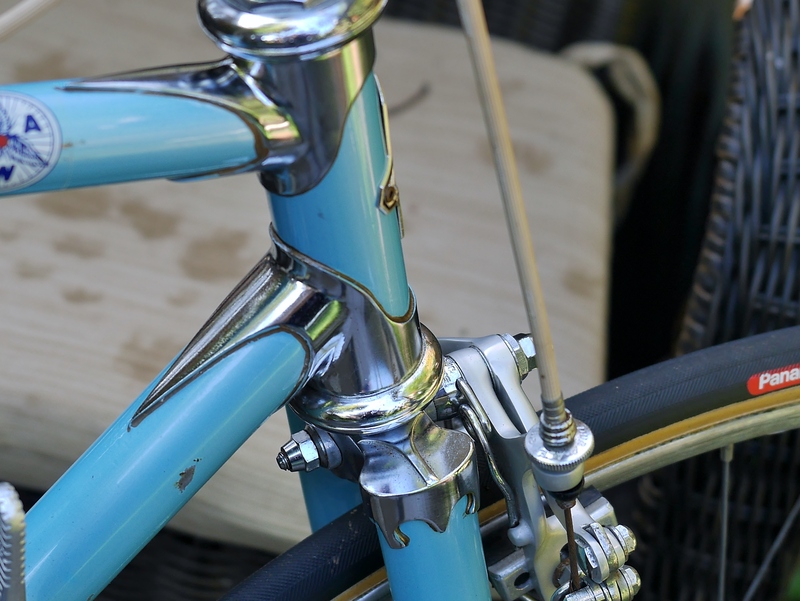 Derailleur design, frame geometry, tubing construction, hub generators, gear ratios, and many other concepts were worked out long ago, and very elegantly. 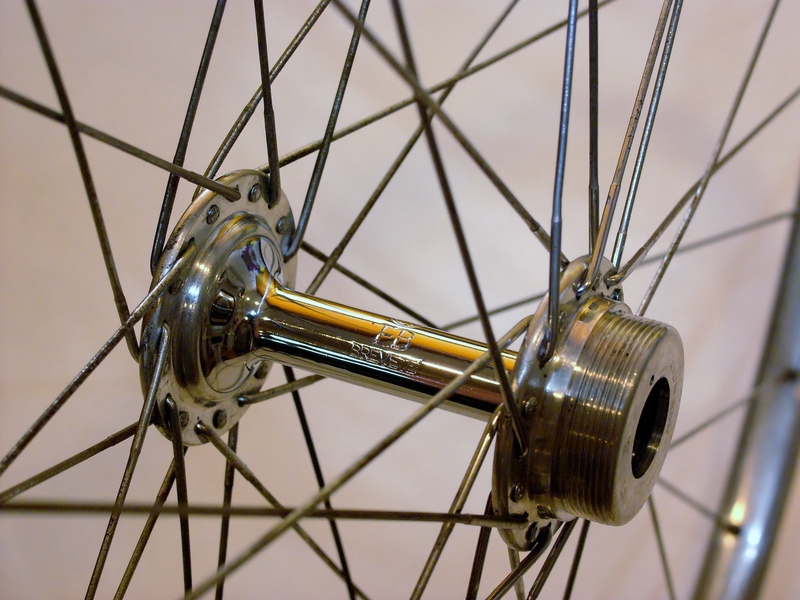 Modern components focus only on simplicity for the cyclist rather than on something which will endure over the ages. 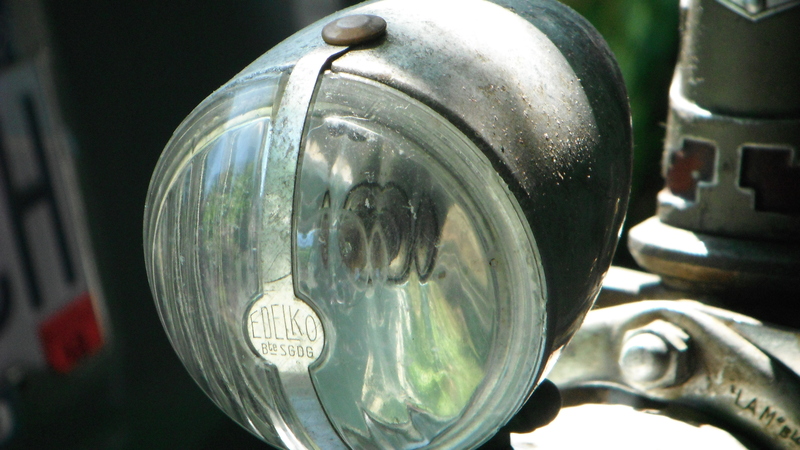 Vintage components were designed to last over decades of use. That’s what makes my job so restorative to my soul. This evening as I walked into my shop I smiled with joy at the classic machines I am privileged to ride, including this 1975 Centurion Semi Pro. Tomorrow will be a dry day here in Pdx, and I’m looking forward to my bicycle commute – and smiling because I don’t even know which bicycle I will choose. 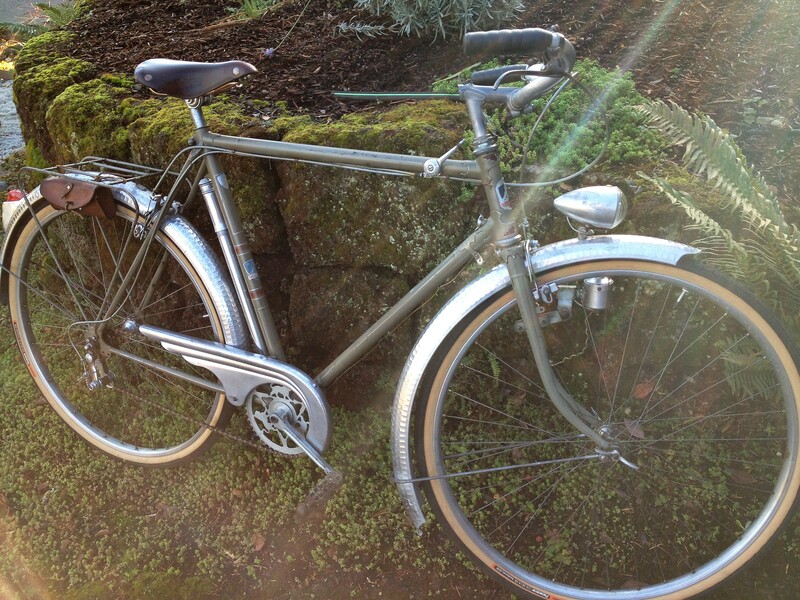 Working on all these wonderful vintage bicycles is an honor, and I hope, a job well done. 1929 Peugeot freewheel and fixed cog – for the Griffon’s flip flop hub. This custom Daudon was built for Irene Faberge Gunst. 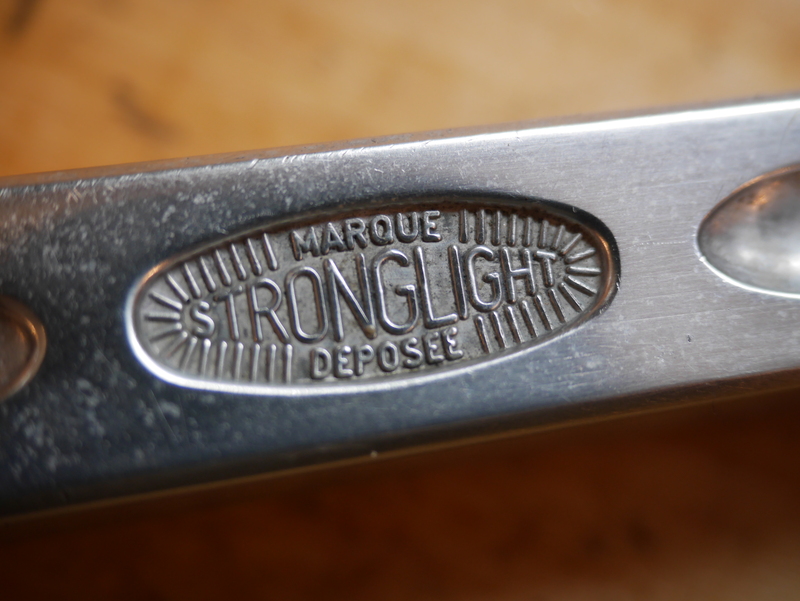 The engraved cap can be unscrewed, with a tool kit stored inside the steerer. 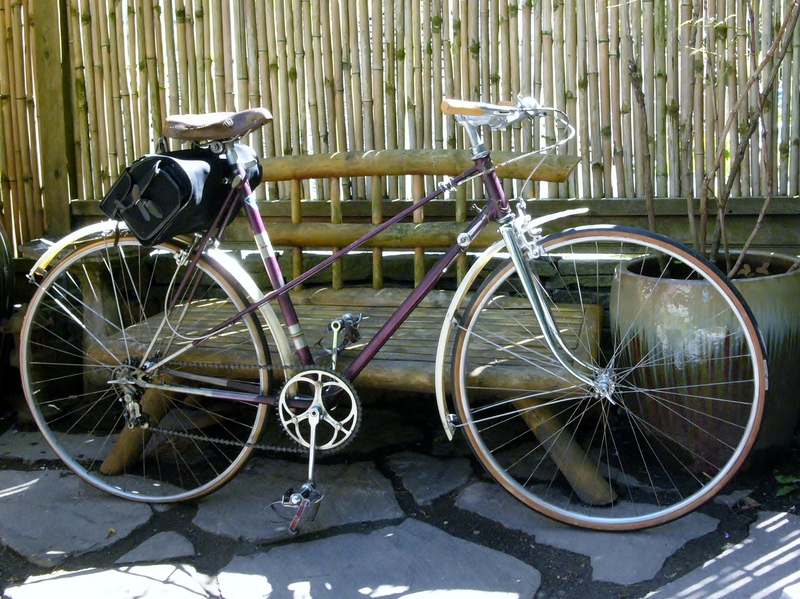 A 1947 Peugeot Mixte. 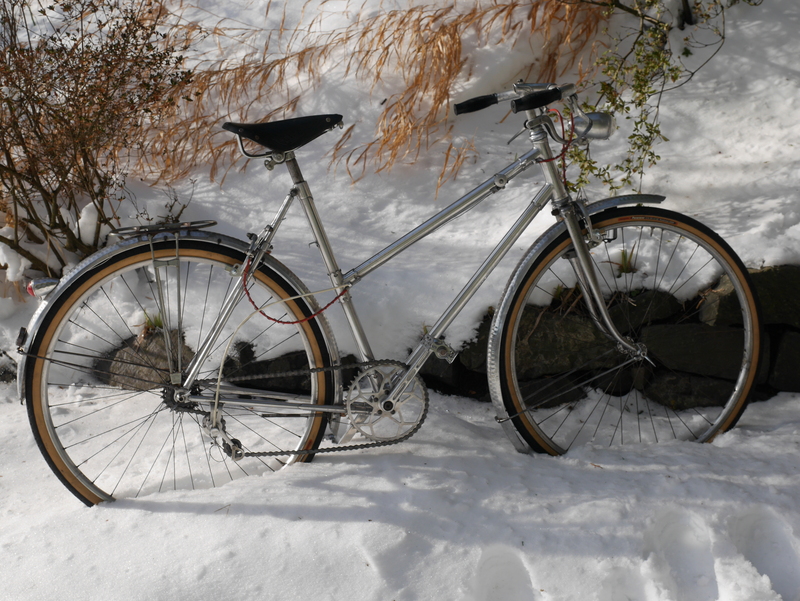 The bike when acquired consisted only of the frame and a few components. 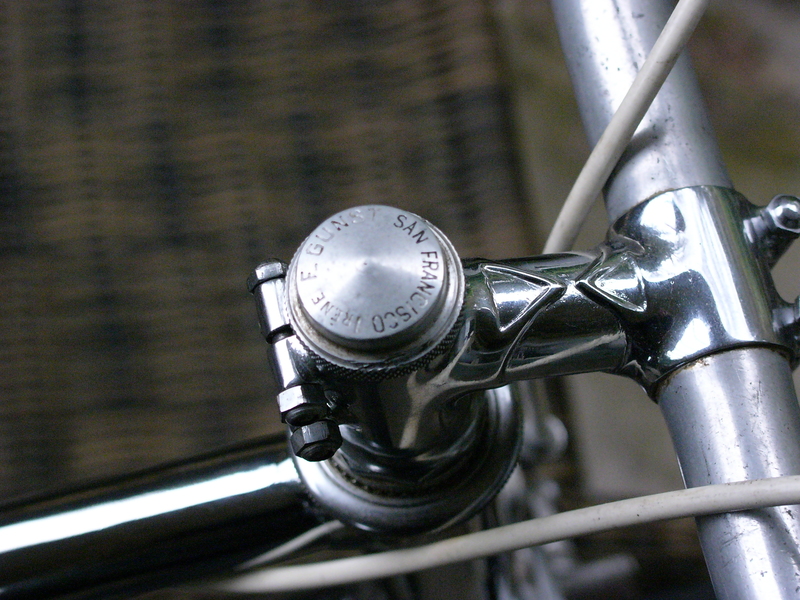 A beautiful Simplex TDF rear derailleur on the 1947 Peugeot Mixte. 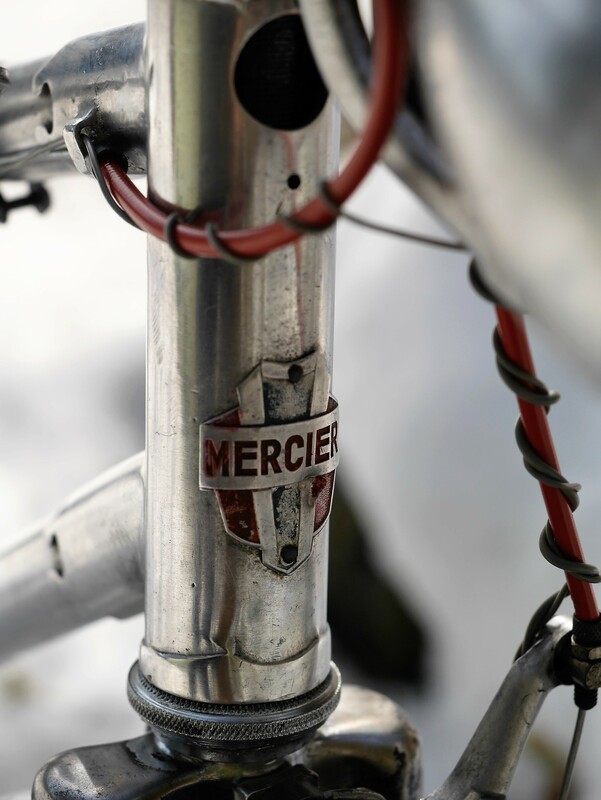 Early 50’s Mercier Meca Dural head tube. The upper head badge is missing. 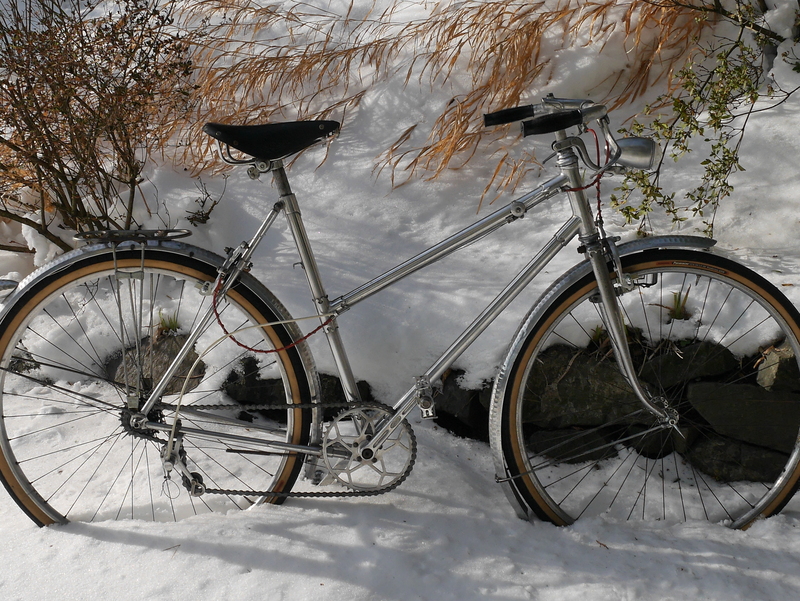 Early 50’s Mercier Meca Dural in a Portland snowy winter. I’ve taken this bike out on the road – very fun to ride. 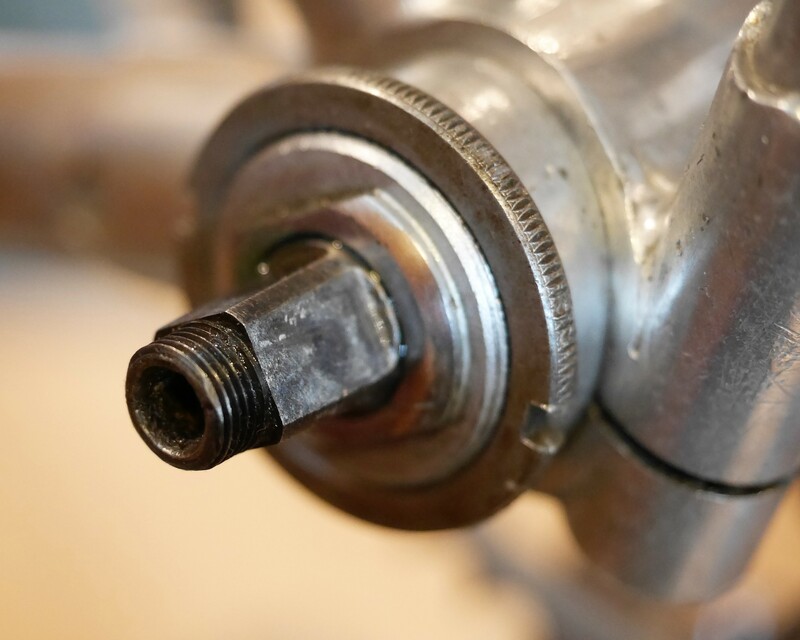 It is built with duralumin tubes which are held together with ornate lugs via internal steel expanders. 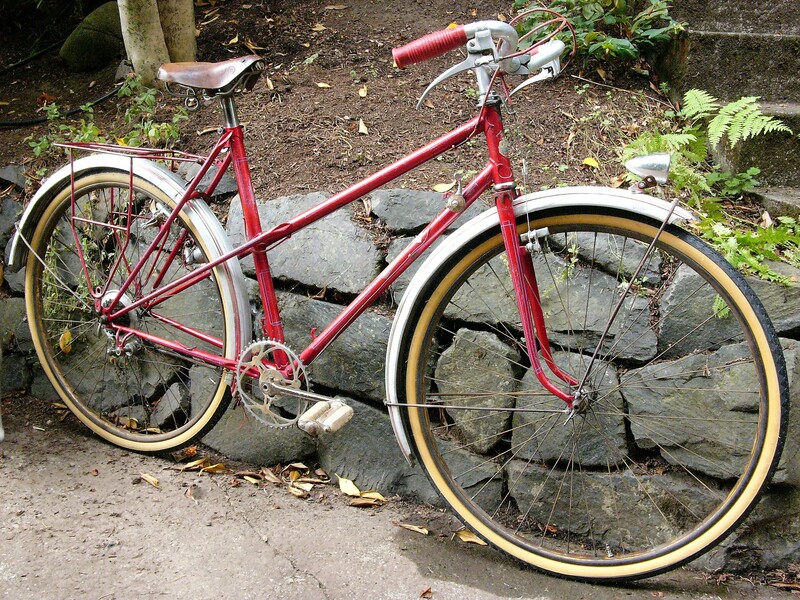 A 1953 French mixte with Oscar Egg lugs. Astoundingly gorgeous Fratelli Brivio (“FB”) hubs were among the many interesting components found on the Oscar Egg mixte. 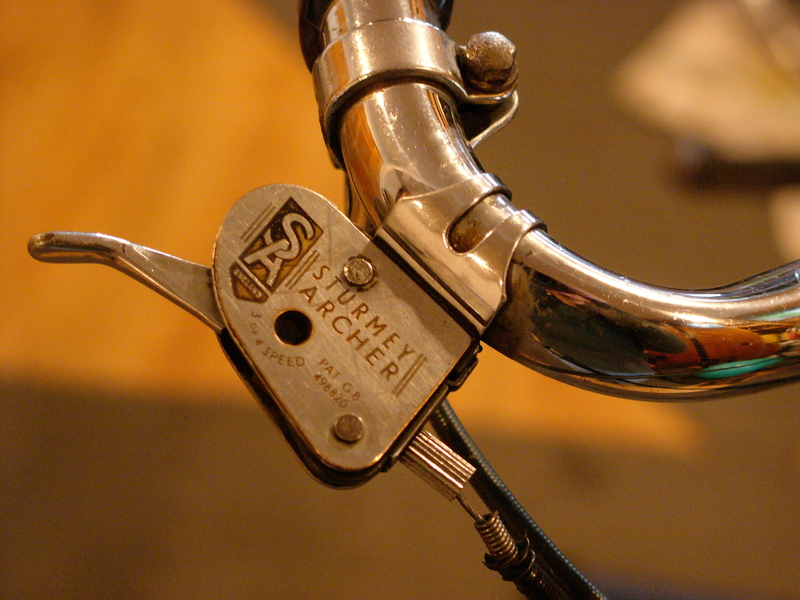 A 1941 Goeland. My restoration of this bike is still in progress. A rare pre-WWII example. 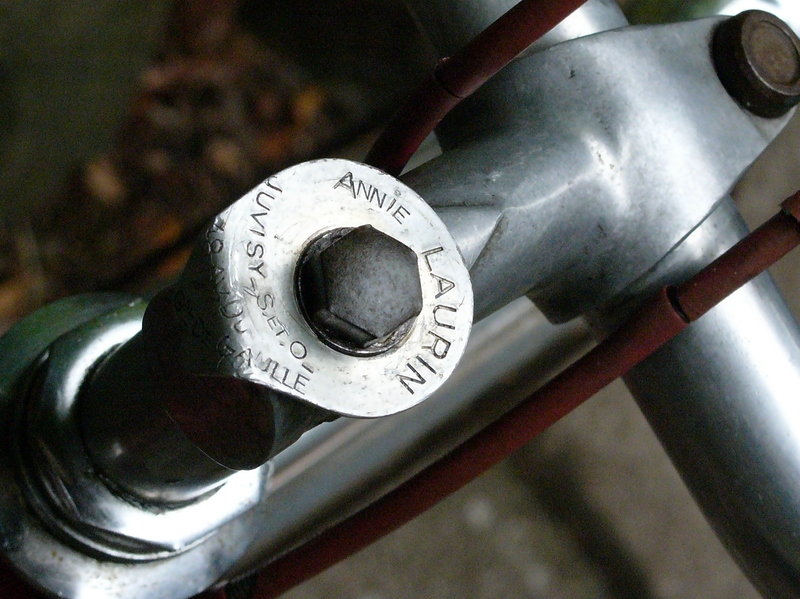 The Goeland belonged to Annie Laurin – with her address noted on the engraved tag. 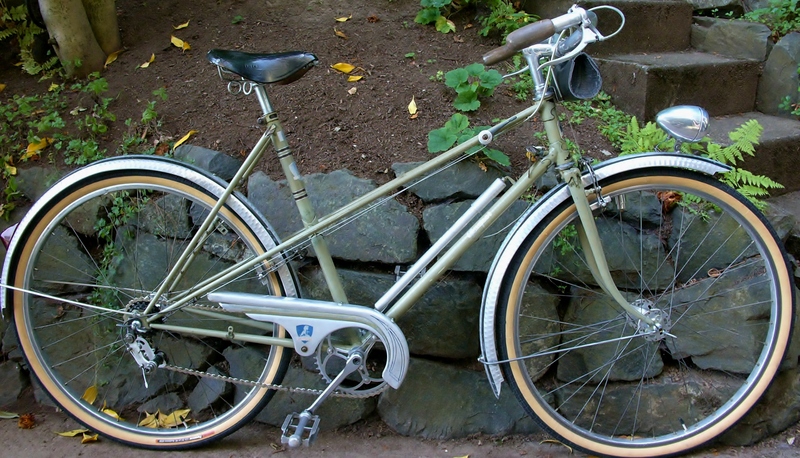 1950 Raleigh Sports Tourist. This bike gets the most views and comments from my readers. It’s an amazing machine, and a joy to ride. 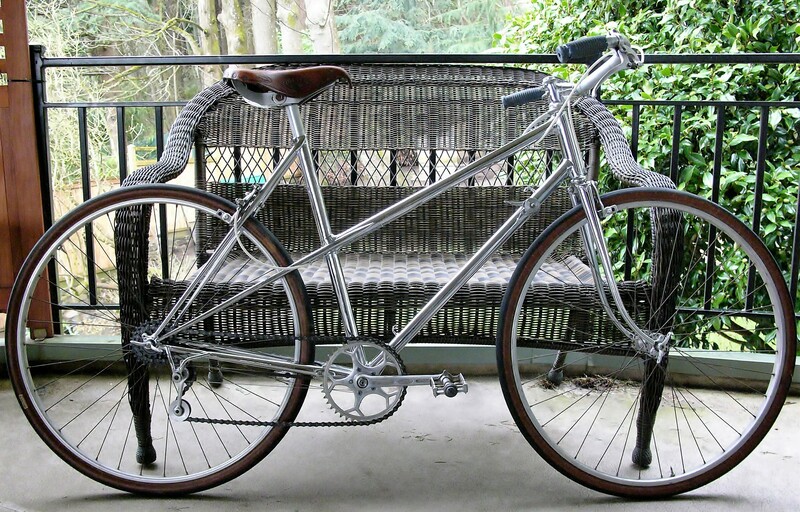 Today I ventured out for a test ride on this Mid-Century Mercier Meca Dural – a bike which had been incorrectly modified when I acquired it last fall. I spent the winter restoring it and replacing many of the incorrect and missing components. But, I hadn’t had time in my schedule to get the bike out on the road for a test ride until now. 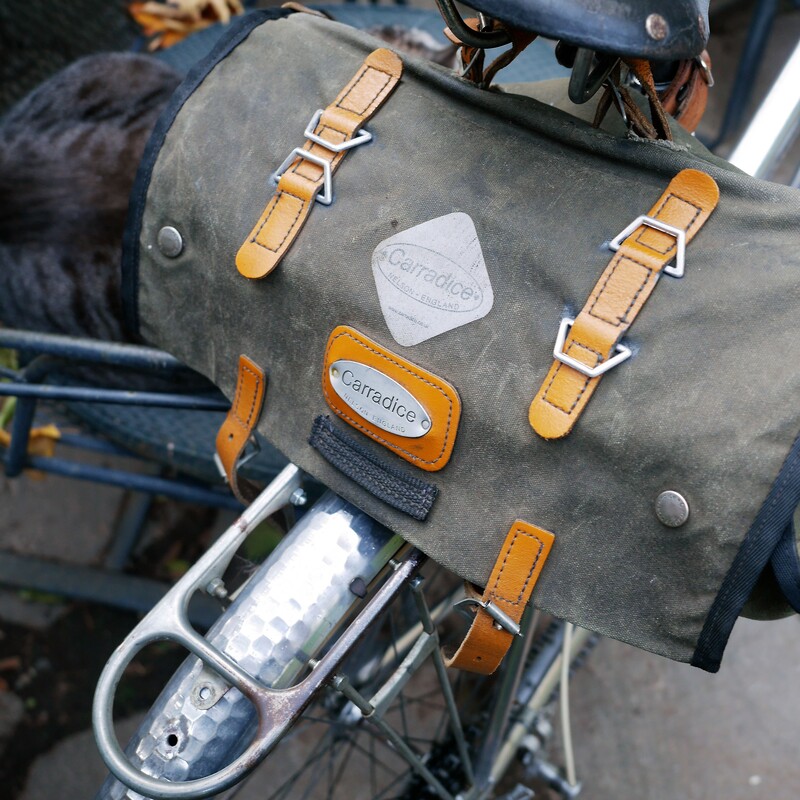 Carradice Long Flap saddlebag – stuffed with all the possible tools need for a first test ride. 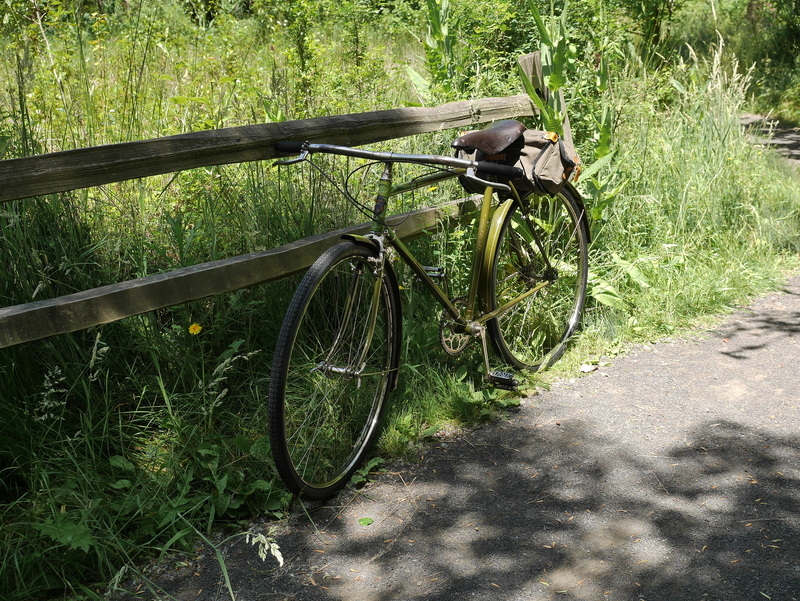 Unfortunately, I chose a bad moment to take the bike out to Sauvie Island – one of my favorite low key cycling jaunts. It’s the weekend before Halloween, which I realized only too late upon arriving at the Sauvie Island parking lot where cyclists normally unload their bikes for a journey around the bucolic beauty of this little island treasure near Portland. That meant hordes of cars heading to the Pumpkin Patch – a place where kids can enjoy all kinds of thrilling Halloween activities. There are no shoulders on the flat roads of Sauvie Island, so cyclists who venture there rely upon the good will of the Island’s drivers, which is usually just fine. 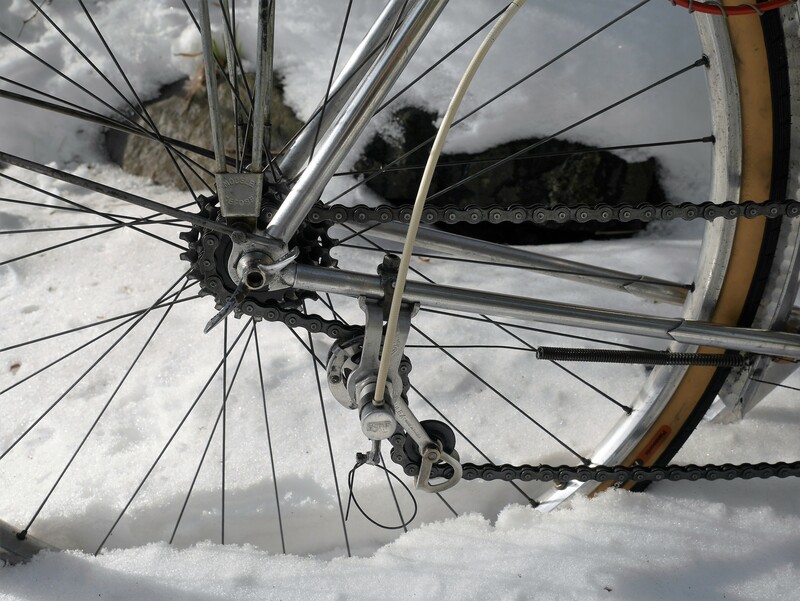 Today, however, was not the right day to take an untested bike into this environment, and that realization dawned on me after just a few minutes of cycling on the Meca Dural’s duralumin frame. The ride I cut short to avoid the stress of a steady stream of vans and SUVs passing too close provided some valuable information. 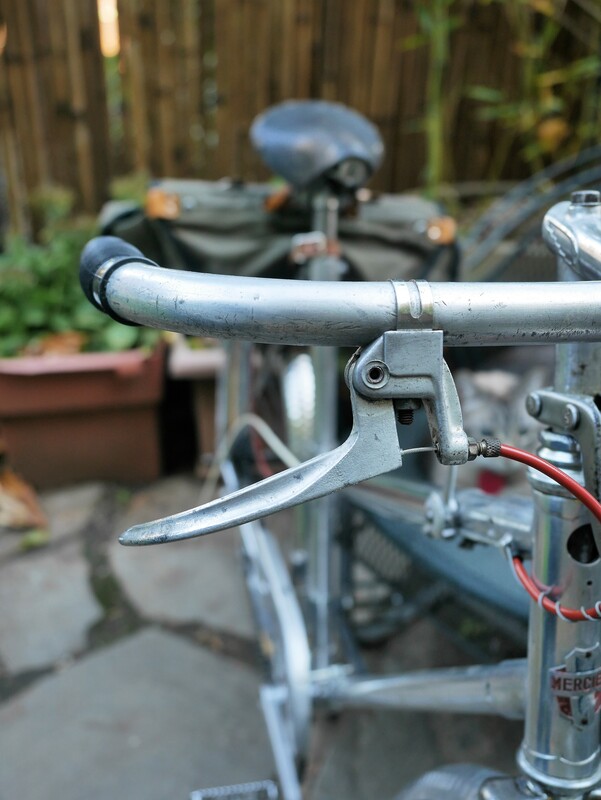 One thing I learned was that these original guidonnet aluminum alloy levers have an unusually long reach, so if you need to brake suddenly and don’t have gigantic hands, you may not stop as quickly as you would like. The C.M. long reach brake calipers have quite a bit of flex under hard braking. This caused the front brake to jump a bit when I attempted to stop suddenly. That may simply mean that the brake mounting bolts need a bit more torque – so that’s an issue to sort out. 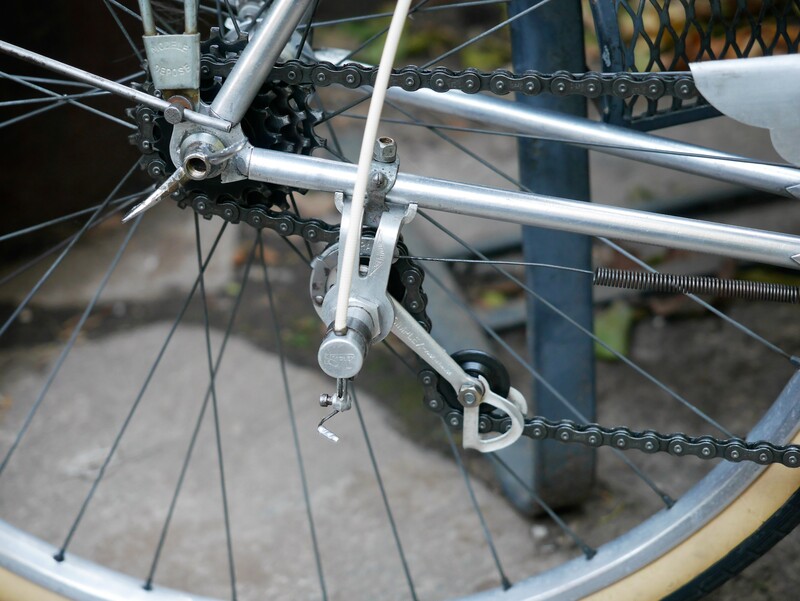 I also discovered that the lovely vintage Rigid chain guard which I had installed using a combination of new and vintage mounting hardware needed adjustment, as the chain rubbed against the guard in the lowest gear. 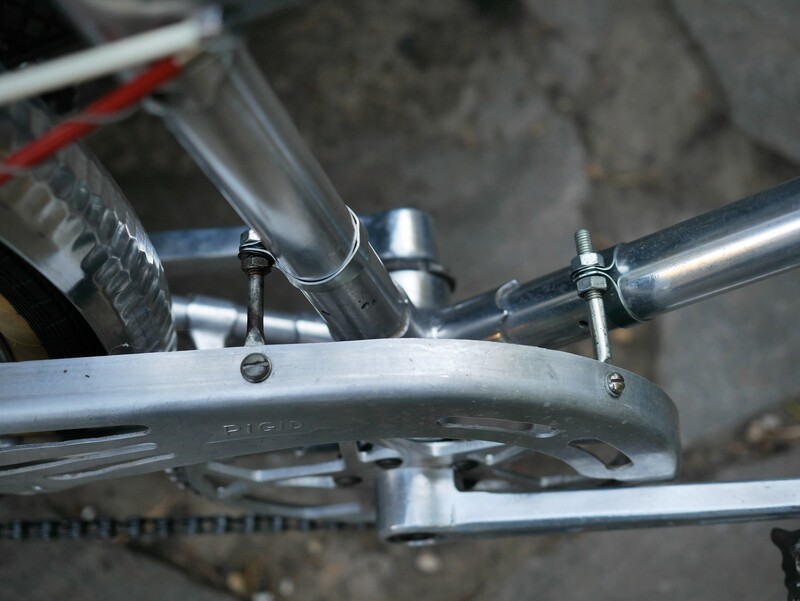 Fortunately, this mounting hardware makes it very easy to adjust the position of the chain guard by turning the nuts on the long connecting bolts. 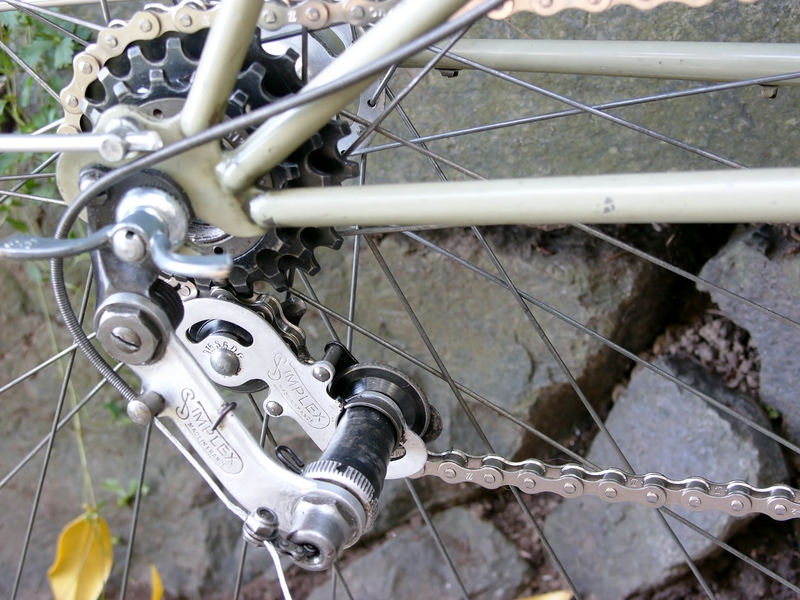 Vintage Simplex Grand Tourisme rear derailleur. 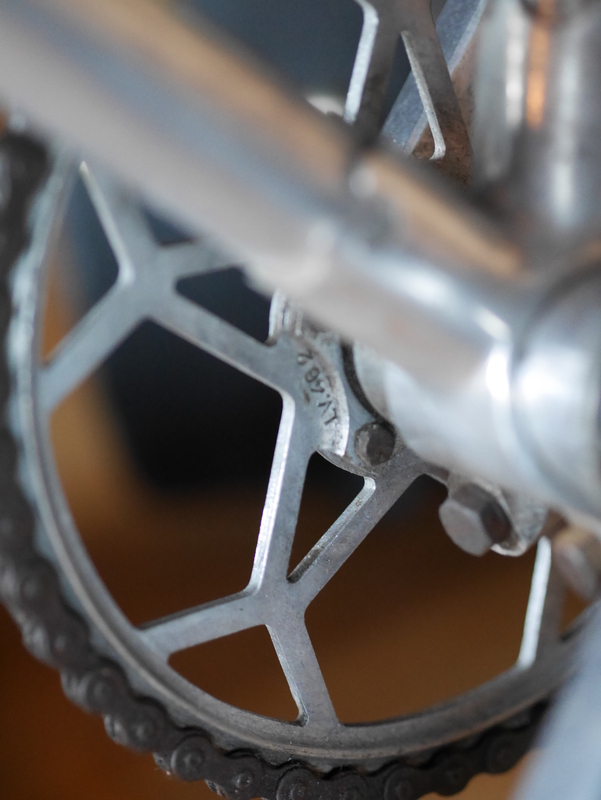 The 3 speed freewheel is mated to a 46 tooth Louis Verot chainring on Stronglight 49d crank arms. The small cogs make for high gearing, which was almost too high even on the totally flat roads of Sauvie Island. 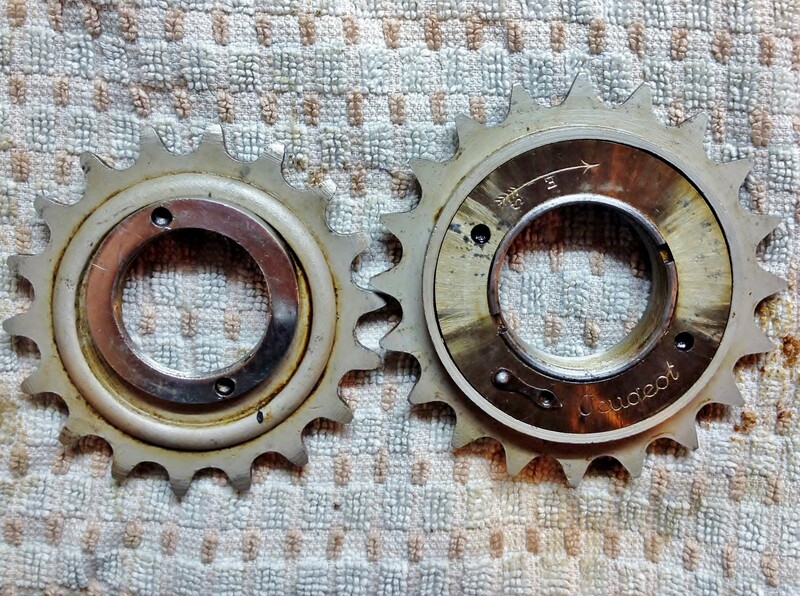 One solution will be to locate a vintage french threaded freewheel with larger cogs. 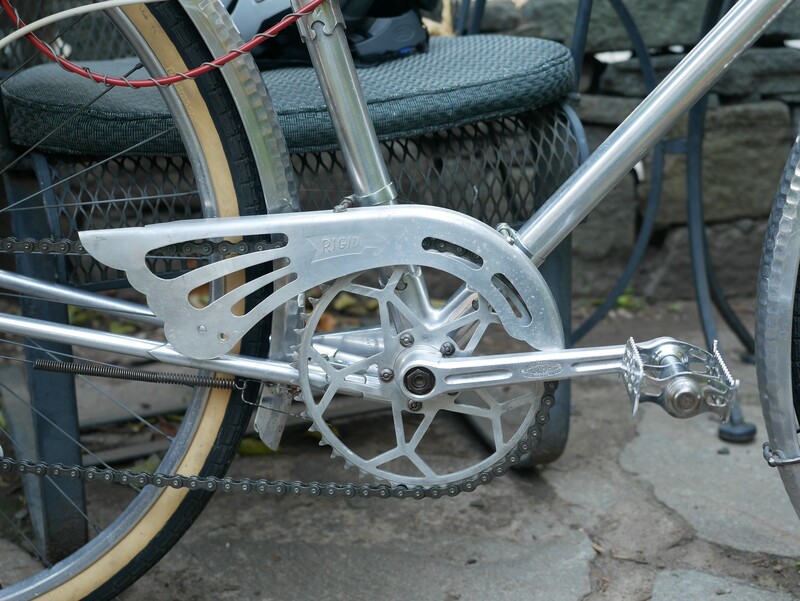 The bell crank actuated Simplex derailleur worked perfectly and can definitely handle larger-toothed cogs. Shifting was straightforward, with no noticeable over-shifting required. Since I didn’t have the original chain, I had guessed at the chain length. The ride quality overall was comfortable. 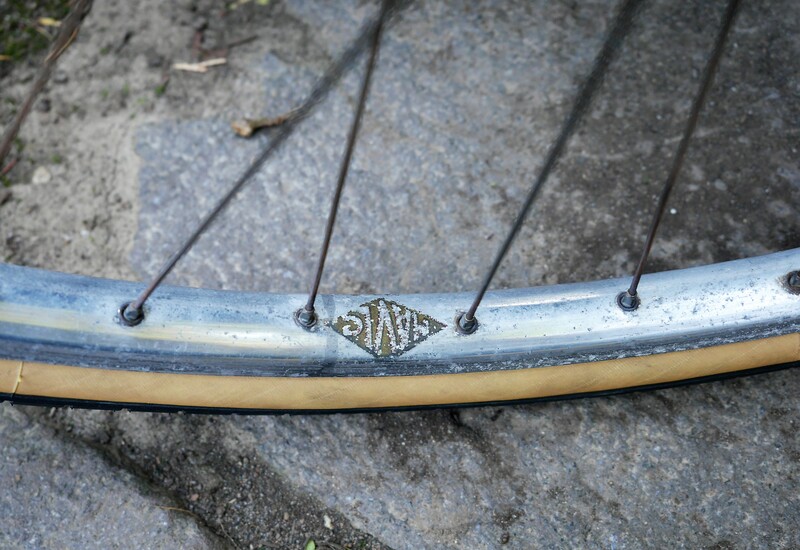 I attribute this primarily to these wonderfully preserved vintage Mavic 650b rims and the new Panasonic tires, inflated to fairly low pressures, as well as to the flex characteristics of the duralumin frame. 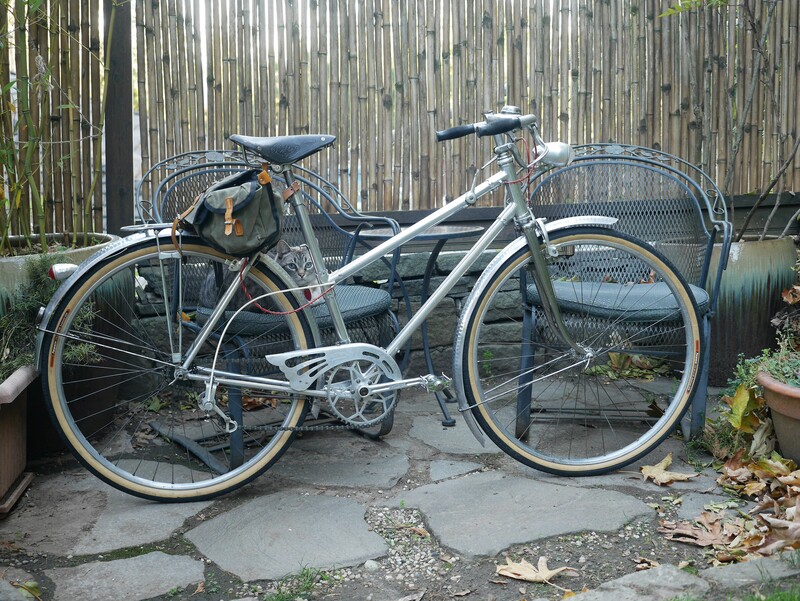 This bicycle’s frame design doesn’t include an extra set of mixte stays extending to the rear drop out. Initially, I experienced a bit of a wobbly feel at the front end, which would likely become a non-issue once a rider gets this bike underway for a few miles. Meca Dural ornate aluminum lugs joined by internal steel expanders. Kitty is optional equipment. After this brief ride I know what is needed to make the bike more useful and reliable. 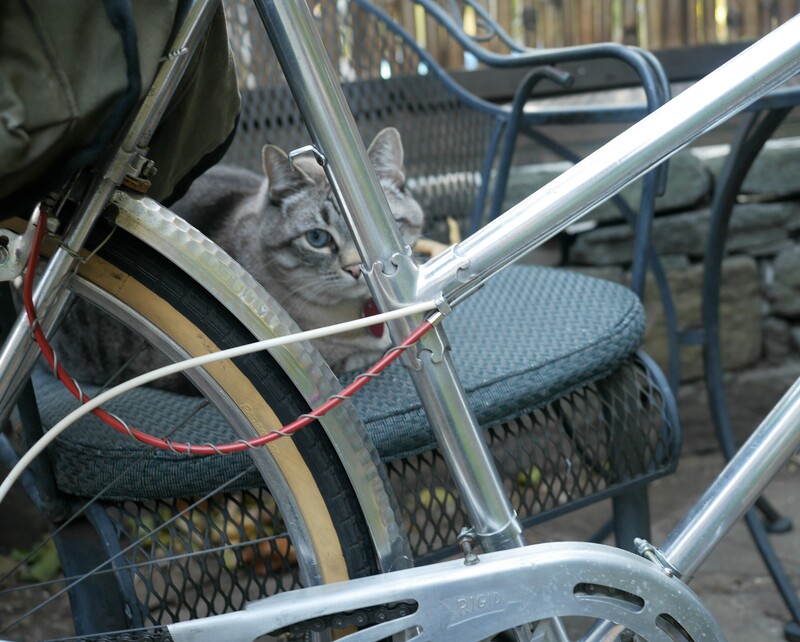 And, I didn’t worry about the Meca Dural aluminum tubes – they performed no differently than any steel framed bike I have ridden. 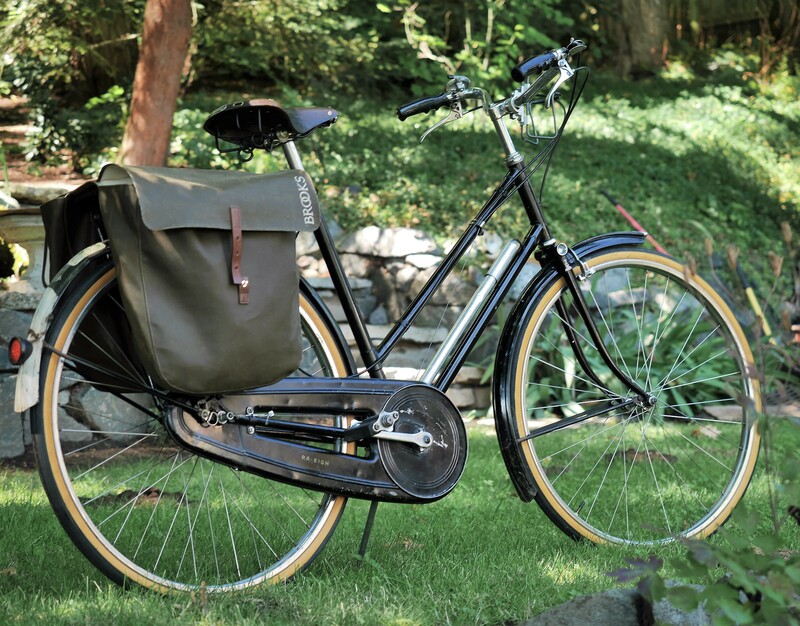 The bike as pictured weighs 24 lbs – very impressive considering the full fenders, chain guard, and dynamo lighting system. The next time I ride this bike, I hope to have a bit longer and more enjoyable ride.